Foil an assassination attempt in Daggerfall. Daggerfall — Unravel the mystery of Daggerfall. Bloodthorn assassins plan to kill King Casimir. 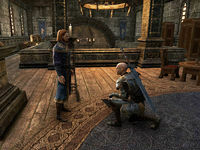 If the King dies, the entire Daggerfall Covenant could fall apart. 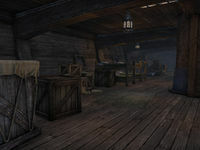 Investigate the ships in Daggerfall Harbor. As soon as you finish the quest Blood and the Crescent Moon, Captain Aresin will tell you to go to the harbor and find the Bloodthorn assassins, then let Sasana at-Abbas know about anything you find. The harbor is just west of the Rosy Lion. Run down all the stairs and turn north and continue onto the path at the bottom. Talk to Sasana who is in a storage area down here. She tells you to find the assassins and kill them. Leave the storage area and head southwest down the path. At the docks run down the first one until you hit a ramp going onto the ship. Open the door against the east wall and break the box to reveal a Bloodthorn assassin who you will have to kill. Now leave the room and climb off the ship. Head east back up the docks and then follow the path up until you reach the top of the stairs. Go to Tradesman's Square just outside Daggerfall Bank and head northwest up the path. Continue past the bridge, up the stairs to the north and then the big staircase going west. Enter the Castle and walk towards King Casimir. When you get close, Bloodthorn assassins will appear. They respawn infinitely, so it's no use to kill them; you need to cut the head off the snake. Follow the king north through the door and up the stairs. At the top you'll be attacked by Verrik, the Bloodthorn leader. Watch out for his spinning attack and remember to block. When he is dead, talk to King Casimir for your reward. If you open the wrong crate, it is likely you will find an Argonian Stowaway. This page was last modified on 8 December 2018, at 09:12.